Chinese President Xi Jinping inspects Chinese troops of People's Liberation Army (PLA) Hong Kong Garrison at the Shek Kong Barracks in Hong Kong, June 30, 2017. There is but one chairman in China, and that is Chairman Mao Zedong. He served as chairman of the central committee of the Communist Party of China, a position so absolutely powerful that party leaders retired it within years of his death in 1976. But is the title truly retired? Maybe not, given hints this summer that President Xi Jinping may be angling to resurrect it. Xi is both general secretary of the Central Committee of the Communist Party of China as well as chairman of the Central Military Commission. But as the party prepares for the 19th National Congress, a twice-a-decade gathering scheduled to begin in Beijing in several months, that deviation from standard protocol — general secretary rather than chairman, as was favored by Deng Xiaoping, Jiang Zemin and Hu Jintao — has some analysts thinking Xi may want to re-establish the position. 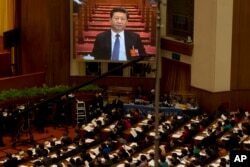 Chinese President Xi Jinping is displayed on a large screen during the opening session of the annual National People's Congress in Beijing's Great Hall of the People, March 5, 2016. The president’s review of the camouflaged troops showed that “if the PLA and the country go to war, he is in charge,” Tai Ming Cheung, an analyst of Chinese and East Asian defense and national security affairs, told VOA. “This is a very important signal, especially the timing,” said Cheung, who directs the Institute of Global Conflict and Cooperation at University of California-San Diego. At the party congress, Cheung said, the expectation is that candidates to succeed Xi should be jockeying for position to succeed him. “But there were no other political leaders at any of these parades, so it looks as if he’s not grooming a successor, and it looks as if he controls the military,” he told VOA Chinese. Tom Fingar, a Shorenstein Asia-Pacific research fellow at Stanford University, said the PLA’s response to Xi as party leader rather than president underscores that the army is subordinate to the party, not the people. The party selected Xi as its leader to have somebody cut through “the bureaucratic paralysis, and he has not done that, so he is not running [for re-election] from a position of strength,” Fingar said. A salesperson sits near posters of the late communist leader Mao Zedong on display for sale at a shop near Tiananmen Square in Beijing, Sept. 9, 2016. Still, speculation remains that Xi “will use the congress to further solidify and centralize his power,” Cheung said. Xi thus became the fourth leader so designated since Communist Party rule in China began in 1949. History may explain why some Chinese are wary of reviving Mao’s title. Mao’s Great Proletarian Cultural Revolution, launched in May 1966, unleashed a decade of political and social upheaval in his bid to reassert control over the Communist Party. “All the biggest disasters that occurred during the Communist rule were due to Chairman Mao’s unchecked power,” said Wenqian Gao, a senior policy adviser at Human Rights in China, who was previously a senior researcher at the Research Center on Party Literature of the Communist Party of China. If Xi already has centralized power, why would he still want to be the party chairman? Under the precedent established by Mao, a party chairman “has veto power and is above everybody else,” Gao said. This report originated on VOA Chinese. Is Xi Jinping Putin-izing China?